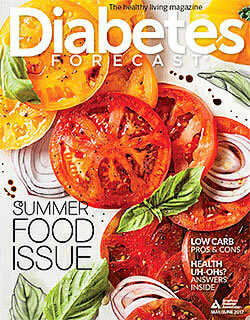 No doubt about it, carbohydrate gets all of the attention in diabetes management. More important than total fat is the type of fat you eat. There are "healthy fats" and "unhealthy fats." To lower you risk of heart disease, try to eat less saturated and trans fat — the unhealthy fats. At the same time, you can protect your heart by eating more mono and polyunsaturated fats including omega-3s — the healthy fats. It is true that all fat is high in calories so it is important to watch portion sizes as well but you can keep your calories the same by cutting back on the sources of saturated and trans fats, while substituting the healthy fats in their place. Instead of 1 cheese stick for an afternoon snack, have 12 almonds. The calories are about the same, but you will have improved your heart health with that single change! Why should you eat less saturated fat? Because saturated fat raises blood cholesterol levels. High blood cholesterol is a risk factor for heart disease. People with diabetes are at high risk for heart disease and limiting your saturated fat can help lower your risk of having a heart attack or stroke. High-fat dairy products such as full-fat cheese, cream, ice cream, whole milk, 2% milk and sour cream. The goal for people with and without diabetes is to eat less than 10% of calories from saturated fat. For most people, eating this is about 20 grams of saturated fat per day. That is not much when you consider just one ounce of cheese can have 8 grams of saturated fat. Many adults, especially women or sedentary men, may need less. To find out a specific goal for you, talk with your dietitian or health care provider. Saturated fat grams are listed on the Nutrition Facts food label under total fat. As a general rule, compare foods with less saturated fat. Foods with 1 gram or less saturated fat per serving are considered low in saturated fat. Like saturated fat, trans fat increases blood cholesterol levels. It is actually worse for you than saturated fat and for a heart-healthy diet, you want to eat as little trans fat as possible by avoiding all foods that contain it. Trans fats are produced when liquid oil is made into a solid fat. This process is called hydrogenation. Trans fats act like saturated fats and can raise your cholesterol level. Trans fats are listed on the label, making it easier to identify these foods. However, if there is not at least 0.5 grams or more of trans fat in a food, the label can claim 0 grams. If you want to avoid as much trans fat as possible, you must read the ingredient list on food labels. Look for words like hydrogenated oil or partially hydrogenated oil. Select foods that either do not contain hydrogenated oil or where a liquid oil is listed first in the ingredient list. Your body makes some of the cholesterol in your blood. The rest comes from foods you eat. Foods from animals are sources of dietary cholesterol. Cholesterol from the food you eat may increase your blood cholesterol, so it's a good idea to eat less than 300 mg per day. Cholesterol is required on the label if the food contains it. The Association recommends eating more monounsaturated fats than saturated or trans fats in your diet. To include more monounsaturated fats, try to substitute olive or canola oil instead of butter, margarine or shortening when cooking. Sprinkling a few nuts or sunflower seeds on a salad, yogurt, or cereal is an easy way to eat more monounsaturated fats. But be careful! Nuts and oils are high in calories, like all fats. If you are trying to lose or maintain your weight, you want to eat small portions of these foods. For example, 6 almonds or 4 pecan halves have the same number of calories as 1 teaspoon of oil or butter. Work with your dietitian to include healthy fats into your meal plan without increasing your total calories. Monounsaturated fats are not required on the label, but many foods that are a good source do list them. Polyunsaturated fats are also "healthy" fats. The Association recommends that you include these in your diet as well as monounsaturated fats. Like the other healthy fats, you want to replace the sources of saturated fat in your diet with polyunsaturated fats. Omega-3 fatty acids help prevent clogging of the arteries. Some types of fish are high in omega-3 fatty acids. The Association recommends eating non-fried fish 2 or 3 times a week. NOTE: The Food & Drug Administration and the Environmental Protection Agency have issued a joint consumer advisory about mercury in fish and shellfish. This advice is for women who might become pregnant; women who are pregnant; nursing mothers; and young children. Your fish and shellfish consumption should be limited to no more than 12 oz. per week. Get a more detailed explanation from the FDA. This two-page introduction to choosing healthy fats is in PDF format so you can download it, print it, and hand it out to patients.